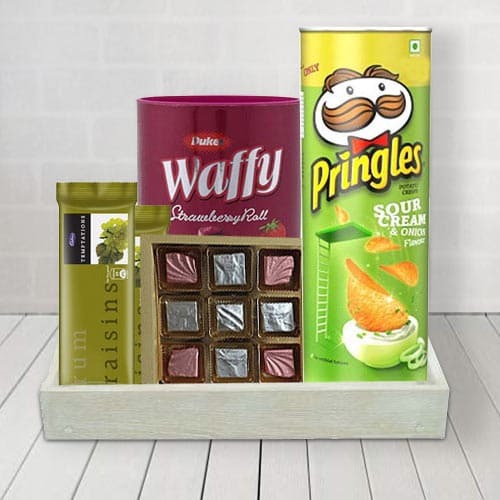 A unique gift for any special celebration, this Gift Basket with Delicious Sweet and Salty Treats for him welcomes the happy feelings into the lives of the people you love. Chocolate lovers will delight at the contents of this Hamper which is guaranteed to tickle their taste buds as it comprises of Handmade Chocolate Box (9 pcs), 2 Cadbury Temptations Rum n Raisins, Dukes Chocolate Rolls and Pringle Chips. These items are perfectly packed in a Wooden Tray.